The 1960s were a very turbulent time, in almost all aspects of life. Blacks integrated with whites; people burned draft cards and bras; and “the Establishment” was slowly losing its grip on the collective kultur. 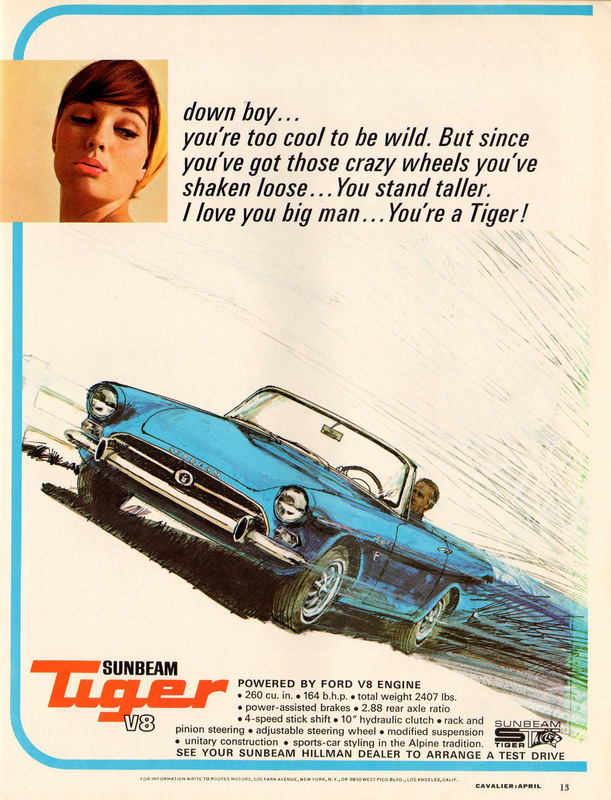 This 1965 advertisement is from Sunbeam, a long-dead British carmaker who seems to have had a crisis of its own. For some reason, they stuffed a Ford V-8 engine into their Alpine convertible, turning their milquetoast sporty runabout into a ferocious beast called the Tiger. (Well, more ferocious than the Alpine, but not as fast as a modern-day SUV.) If the car looks familiar, it’s because it starred in Get Smart‘s opening scenes for a few years. This entry was posted on August 25, 2014 at 5:39 am and is filed under Automobiles. You can follow any responses to this entry through the RSS 2.0 feed. You can leave a response, or trackback from your own site.